The only windproof ashtray for cigars & cigarettes in this size. This unique 2 part large commercial grade windproof ashtray hides ash & cigar & cigarette butts inside & keeps tables clean & ash free, especially in a breezy outdoor setting. Specially designed holes makes snuffing of cigars & cigarettes easy. This is the perfect smoking accessory for indoor or outdoor use. The easy-clean melamine makes it heat resistant and dishwasher safe. Used on cruise lines, luxury hotels and other commercial applications. The unique removable lid keeps ashes from being blown by wind and reduces odor while keeping ash and butts out of sight, even while smoking. You can enjoy a continuously clean-looking ashtray. Holds cigar & cigarettes at the same time. 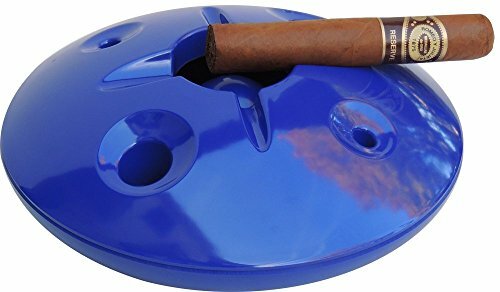 Color of this ashtray is Royal Blue, for White search B000KWWDQ2, for Black B00PGXR5CW for Chocolate B01LWNLHQL and for 5 inch Royal Blue search B0796PZBYX. If you have any questions about this product by Talon Development, contact us by completing and submitting the form below. If you are looking for a specif part number, please include it with your message.